Google announced Wednesday that it would shut down its online RSS reader. The search giant said it is going through a second year of spring cleaning, shutting down services like Google Reader and ending support for services like Google Voice app for BlackBerry and search API for Shopping. "We launched Google Reader in 2005 in an effort to make it easy for people to discover and keep tabs on their favorite websites," Google's Urs Holzle said in a blog post. "While the product has a loyal following, over the years usage has declined." Google will turn off Reader on July 1, 2013. Disgruntled fans of the service took to Twitter to express their disappointment and willingness to pay money for the service. 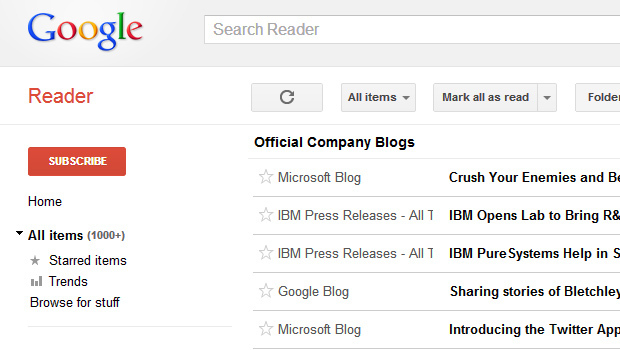 Dear @google, please turn Google Reader into a paid service and keep it alive. I'd throw money at you for it. In a Quora post written by what appears to be former Google Reader project manager Brian Shih, he said that Google Reader was never profit-driven. The service has been suffering from a reduction in staff for years. We've given an overview of our reasoning and plans on our blog posts on the Official Blog and the Google Reader blog, and we'll be communicating directly with our users as we make these changes. We don't have anything more to share than what was in the posts. Web users who still rely on RSS feeds to organize content do have several alternatives. Setting up a new feed can be a pain, so Google has offered advice on how to transfer Reader data. The search giant suggests using Google Takeout to export xml files that should have subscription information from Google Reader. People looking for a json file will have access to some data from Google reader. Netvibes is a service has been around for about as long as Google Reader. Its basic service is free, and users can pay more for features like analytics, alerts and sentiment. Netvibes even has directions on how to import Reader information using Google Takeout.